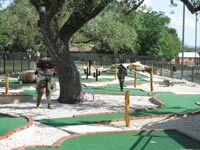 Just a couple minutes east of the fun and lively town of Bandera (the "Cowboy Capital of Texas"), Flying L Ranch offers guests a little bit of everything: good food, a variety of accommodations, outstanding water park, 18 holes of golf, and plenty of activities and things to do. 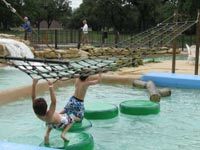 Kids, golfers, weekend adventure seekers, equestrians, and first time visitors to Texas are going to love this place. We booked our weekend stay in May 2009 and we weren't sure what to expect - a dude ranch, a resort, a hotel with amenities, a golf resort, or just another tourist trap. We were pleasantly surprised to find out it is some of each of those. And we had a fun and enjoyable stay. 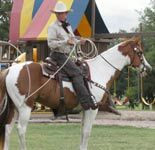 The 772 acre Flying L Guest Ranch has been a favorite destination for war heroes, movie stars, and literary giants since 1946 and some of the guests included John Wayne, Willie Nelson, Tex Ritter, Ray Price, Buck Owens, and Slim Pickens. "The Cisco Kid" television show was filmed at the Ranch. So you know this place is special. Flying L has a variety of accommodations all of which are suite style villas with one or two bedrooms that sleep 4 to 6 people. 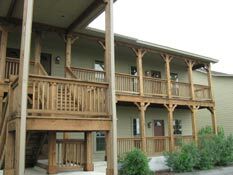 Each of the villas has a living room, bedroom, bathroom, coffee pot, refrigerator, microwave, TV, and daily maid service. 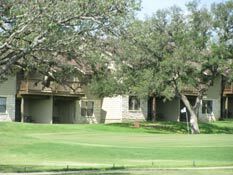 Some of the villas are on the 18th hole of the golf course, others overlook the Waterpark, and a number are stand alone type small homes under the oak trees. We stayed in a villa overlooking the Waterpark. Our room had one bedroom, living room, kitchen, and a small room off the entry with bunk beds. It was very clean, spacious, well furnished, and comfortable. For something unique and fun for kids, rent one of the Fort Apache Cabins and a Tee-Pee for your stay. 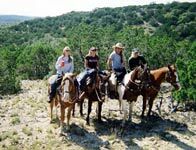 To learn more about the options when you stay at the Ranch, check out this page on the rooms at Flying L Guest Ranch. The San Julian Creek runs through the Ranch and they have set up an amphitheater, small pavilion, and tables for creekside BBQ's, campfires and marshmallow roasts, or special events. If there is water in the creek, you might even catch some fish. 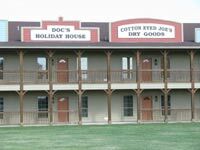 The recreated Ghost Town and the Ghost Town Pavilion are open for special events and parties and a short walk from the rodeo arena. If you need a souvenir of your stay, the General Store has a good selection plus jewelry, apparel, toys, games, and more. After golf and all the exercise we got during our stay, we were tempted to call the front desk and schedule a relaxing massage to work out the kinks, but decided that if we did, we would never get back up and out to the honky tonks that evening. We did hear that the massages and facials are excellent and we're sorry we missed them! The breakfast buffet and a dinner buffet are included in the price of the room. During our stay, the dinner buffet included a salad bar, beans, corn bread, potatoes, BBQ chicken and sausage, dessert, and more. Tasty! 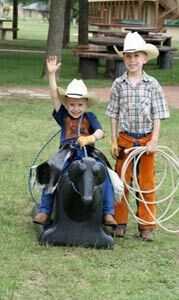 Every evening, the Ranch has some type of entertainment from gun slingin' and ropin' to sing-alongs, rodeos, branding parties, or campfires and marshmallows. When we stayed they had Kevin Fitzpatrick the World Champion Trick Roper. This didn't sound real exciting when we heard about it, but we decided to check it out anyway and are glad that we did - it was fantastic, funny, and entertaining. We loved his sense of humor, the way he worked the audience into his show, and we were amazed at what he is able to do with a rope. Good show. After the roping show, we headed into Bandera to bar hop and listen to some great bands. Bandera is home to some of the best Texas Honky Tonks. We heard that Bandera has 18 churches and 23 bars and the locals are either praying or partying! 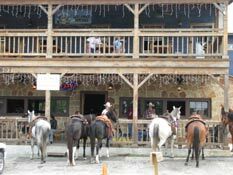 The bars are a blast and a wide mix of very friendly locals who range from cowboy ranch hands to rich ranch owners. Most of the bars have live music. See our Guide To Bandera and Bandera Top Ten Things To See and Do to learn more. After a night of bar hoping and dancing, Flying L's breakfast buffet was the perfect way to start the day - we loaded up on the carbs and calories by overdosing on the omelets made to order, pancakes, bacon, sausage, biscuits, fresh fruit, coffee, and juice! We were tempted to waddle out to the pool, plop down in a lounge chair and lay there the rest of the morning. Instead, we waddled over to the golf course and teed off for a fun round of golf. The Flying L Golf Course is outstanding. With 3 tee boxes with yardages from 5442 to 6646 yards, the course can challenge the best and yet remain fun and enjoyable to play for the rest of us. 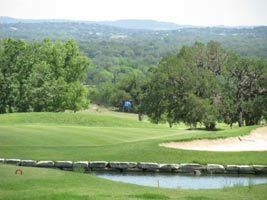 It's a scenic course that meanders through the Ranch, in and out of a small neighborhood, and up and down the rolling treed terrain. You'll find some dog legs, water holes, elevated greens and tee boxes, strategically placed bunkers, and huge beautiful trees to contend with. Number 3, a 403 yard par 4 # 7 handicap is a good example - from an elevated tee box you have a downhill shot that needs to be pretty accurate to ensure you can make the sharp dog leg left, short enough to not carry into the trees, accurate enough to avoid the huge stately oak in the middle of the fairway, and straight enough to stay in the fairly narrow landing zone. Survive all that and your second shot (or in my case, my third shot) to a sloping green needs to avoid the bunker on the right and water on the left. That's only one of several fun and challenging holes. The front nine seems tight and challenging and the back nine is more open and forgiving - a good mix of variety. 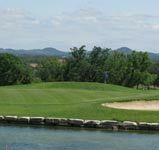 To learn more and see some pictures, read our review of Flying L Golf Course. When we played in May, I was impressed with the course conditions. The fairways were well groomed and in above average condition. The greens were a little slow and in pretty good condition. 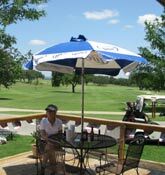 The service is very good, the carts have GPS, and there is a driving range and putting green near the main lodge. Fun course. Prior to our round, I wish we had spent some time on the Flying L's miniature golf putt putt course - my putting sucked! Thinking we had worn off some of the calories riding around in the golf cart for 18 holes, it was time to eat again. The grill at the Pro Shop has a wide variety of sandwiches, burgers, and more plus cold beer and a fantastic deck looking out over the golf course. Again we stuffed ourselves with a good burger and chicken sandwich, fries, and a couple beers. And this time we did waddle over to the pool to enjoy the Waterpark - oh, and sip on a couple great margaritas! In addition to all the amenities, the Ranch sponsors a number of special events and activities each day ranging from barn dances to calf scrambles to marshmallow roasts. When we stayed we enjoyed a number of the above and had a great time, but our favorite was The Lone Star Lagoon Waterpark. 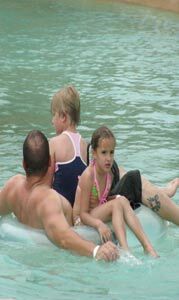 The Waterpark is fantastic and if you have kids you're going to have a very hard time getting them to leave. With over 66,000 square feet of fun, it includes a lazy river, water slides, wave pool, dunking bucket, and more. 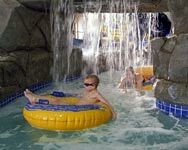 It's easy to want to stay put and enjoy the Waterpark all day and into the evening, but you'll regret it if you don't get out of your swim suit, put on your Levis and chaps or your golf or tennis outfit, and go take advantage of some of all the other fun things to do. Flying L Guest Ranch offers something for everyone from early in the morning to after dusk. 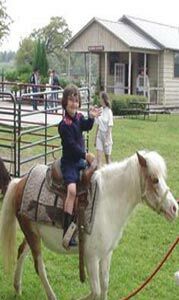 While you're playing golf, horseback riding, or trying to win a set in tennis, the younger kids can be having fun with the Children's Activities Program that includes nature hikes, hay rides, arts and crafts, scavenger hunts, and more. After the kids have worn themselves out and are tucked in bed, the adults can head over to the saloon for a nightcap or a round of pool or catch a game on the tube. In addition to being perfect for a family vacation, Flying L Guest Ranch is an excellent place for a family or social reunion, birthday party, corporate retreat, golf outing, or location to tie the "knot." They have meeting space, catering services, special events, and more to make your event special and memorable. In fact, when we stayed, a beautiful bride and her bridesmaids were relaxing by the pool and taking turns getting made-up while the bridegrooms were living it up on the golf course, and some of the family and friends were taking a trail ride. When we stayed in 2009, we found the prices reasonable and a variety of packages were available. Any time of year is suitable for a stay at Flying L Guest Ranch - they stay pretty busy so book early.